Maybe you were careless while moving furniture. Maybe you have rage issues and take your aggression out on your surroundings. Maybe you hired a low-budge electrician from Craig's List who bored into your wall to reach your wires and then left without patching it. It doesn't really matter how it got there, but you've got a big ol' hole in your wall. And, really, once that happens, the rest of your decor is pretty much irrelevant. 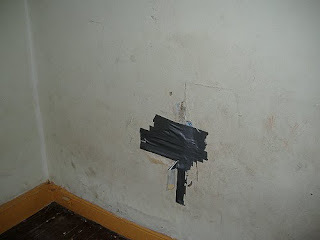 Happily, patching a hole in your wall is a home improvement that you can easily learn to do yourself (and, no, the proper method does NOT involve duct tape). I know it seems complicated, but it's actually very easy, and, look at it this way, there is virtually no danger of electrocution. So grab a putty knife and some sandpaper, and let's get to it. Oh, and while you're at it, you might want to look into anger management courses. 1. Use sandpaper to smooth the edges of the hole to make sure that nothing is sticking out. 2. Cut a piece of mesh tape, or a metal mesh square drywall patch to cover the hole. 3. Use a putty knife to spread a thin layer of patching compound over the mesh. Don't try to cover it too thickly right away- it's more important for it to be smooth. Allow to dry completely. 4. Sand off any rough edges to smooth the first layer. 5. Repeat steps 3 & 4 until the mesh is completely covered and the wall is totally smooth. 6. Paint the patch to match the rest of the wall. And, for God's sake, get control of yourself, man.